Being a pioneer in the meeting room/conference room collaboration and presentation product development is a tremendous feat. But how do you top yourself when you already have an award winning product with tremendous sales growth? How did Barco outdo itself again? Well, Barco is introducing the new CS-100 and CSE-200 models that will transition and compliment their existing offerings. They are tapping into new customers and markets at an aggressive price point while continuing to give them the ease of sharing and collaboration during presentations. The CSM-1, also known as the ClickShare mini has now transitioned into a new model – CSE-200. In addition to the simplicity of Barco’s one-click-wonder, they have completely redesigned the unit with brand new look with all the simplicity of its predecessor. 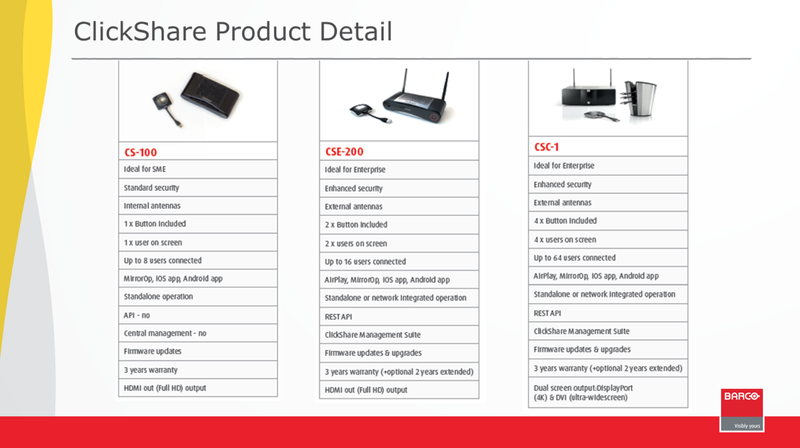 The CSE-200 is taking on the new role of the ClickShare mini and making it even more secure. With updated security embedded into the ClickShare buttons, it becomes even more secure while sharing participant content on the big presentation screen. Barco also added a new cost-effective model, the CS-100, which is a lower cost unit that has most of the features of the CSE-200. The CS-100 model is priced low to allow any potential end-user to invest in a great platform to share content in their meeting room spaces. This model looks a little different than the CSE-200, with no external antennas and only one USB button to share. But, even with only one button end-users can still use the Barco mobile APP (Android & iOS) that will allow mobile device users to still contribute to the main display. These two new additions to the Barco family will be sure to complement its big brother, the CSC-1, which is still available for the larger conference rooms that have more participants. But, the CSC-1 has some fresh news of its own. With a new firmware upgrade, existing CSC-1 ClickShare Classic units can be upgraded to support 4K UHD resolution (with the use of an active DisplayPort to HDMI adapter) and Airplay for iOS 9 devices. Barco continues to elevate itself in the products they continue to develop for the collaboration and presentation. For more information on Barco’s ClickShare or to schedule a demo, contact Eric Olson at eolson@almo.com or 888.420.2566 x4082. Attending InfoComm is essentially a rite of passage for any AV professional. The latest products from major contenders in the AV world come together, bringing out the most innovative technologies from the manufacturers. Meeting new people, observing cutting-edge technology, and getting a feel for where the industry is headed were the high points of my first InfoComm experience. There were definitely a few stand-out moments of the show. One impressive highlight was the unveiling of LG Electronics’ industry leading Full HD Video Wall display. This product has the world’s slimmest, bezel to bezel design at 1.8mm which, combined with their existing IPS and Shine-Out technologies, makes it a perfect fit for window displays and exhibition. These characteristics maximize the viewing angle while reflecting away ambient light for best image visibility and clearer display under direct sunlight. Also, Barco’s latest line of laser projectors was an intriguing feature of InfoComm. These projectors deliver exceptional image quality with outstanding brightness, contrast, and superior color performance; they did not disappoint. Associated benefits also include significant reduction in operating expenses (no more lamp replacement and maintenance), energy efficiency, and a lower total cost of ownership. Last but certainly not least, Almo exhibited the ADTI SkyPanel outdoor digital LED display, a recent addition to their product line. This product is interesting not only from an innovation standpoint, but also from a solutions provider’s perspective. The ADTI SkyPanel is a modular outdoor digital signage product that offers a turn-key solution to any integrator looking to delve into that market. This is an ingenious modular design that reduces energy consumption, dissipates heat efficiently without fans, and is available for shipping and installation within one day. I was (and continue to be) impressed! My first InfoComm trade show event with Almo Pro AV was a very exciting and enjoyable experience. It was an honor to be part of the team that fabricated and exhibited the Almo booth at InfoComm 2015. I was able to become well acquainted with my new team and learned a tremendous amount from them. Aside from meeting all the great people that make up the Almo team, it was an amazing event that provided me the opportunity to view the latest technological advances from our vendors. I am looking forward to InfoComm 2016 and the new innovations to come. What was your favorite new product? Leave a comment below to let us know about your InfoComm experience!